The box arrived! I have to admit I was disappointed by the quantity in the box. On the Web site it shows a box overflowing with oranges and if you count them and estimate how many are in the box, it's quite a bit. The boxes actually come with three trays to keep the fruits from being crushed, I guess. It ended up costing soooo much more than buying the same amount of organic oranges at the co op. WOW! They are so alive and juicy and yummy!!! 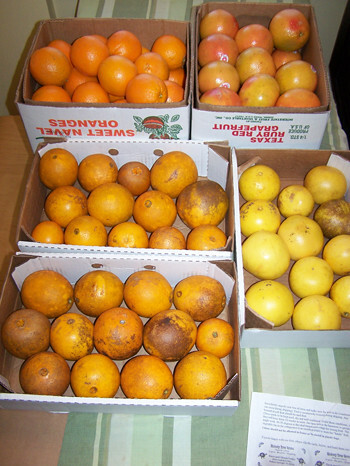 The organic fruits ended up being 38 in total for nearly $63.00. Are they worth 2-3X the amount that I pay for the other organic oranges when I shop at the co op? Yes, and no. If I have extra money, it would be worth it. When the budget is tight it's probably better to get the less fresh organic ones from the co op. The ones from the co op aren't nearly as good, but when you spend significantly more on your groceries each month than you do on your home mortgage, well, sometimes you just can't splurge on such things. 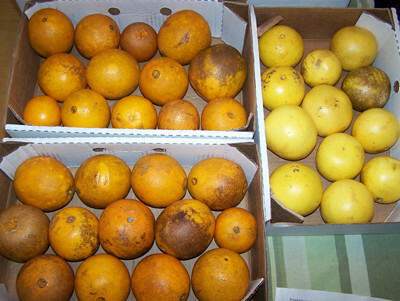 Notice how undyed the organic oranges are compared to the conventionally grown ones? As I was eating one of the organic ones, I noticed in the dripping juice (they are extremely juicy!) that the dark color was washing away a bit. So, I took one of the uncut organic oranges and washed it up in the sink. When I used a bit of natural soap and a dish cloth, the dark washed right off! There in my hand was a beautiful, bright orange! What causes that darkness, I wonder? Is it dirt? Since I don't eat or use the skin of the oranges, it doesn't really matter all that much to me (so I won't be spending time scrubbing oranges before I eat them). I can see now, however, that we really are accustomed to having our fruit and produce looking perfect. The organic ones, honestly, don't look even half as appetizing as the conventional ones. I haven't consumed a conventionally grown orange in many, many years. 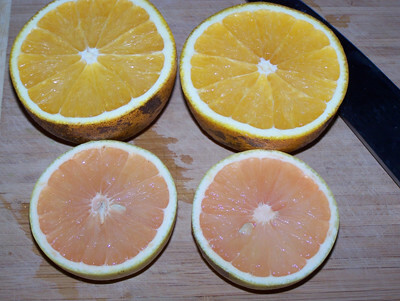 Oranges are heavily sprayed with chemicals and grown with all kinds of stuff I don't want to put into my body. However, this evening I took a small taste of the conventional orange to compare it to the organic one. KDcat did the same. Many of you won't believe this, if you haven't stayed clear of conventional fruits for a long time, but the difference is drastic. As soon as I tasted the conventional orange, I was brought back to the recognition of what an orange tasted like for most of my life. It's a distinct taste that isn't there with organic oranges, but I didn't notice that missing taste until I tasted a conventional orange again this evening. When KDcat tasted the two, she said the conventional one almost tastes like it's rotting in some strange way. Hmm...maybe that was the difference? The conventional one didn't seem so vibrant and filled with energy like the organic one. Maybe on some level the conventional one *was* rotting. It wasn't apparant, however, just by looking at it. Jim used to tell me I was imagining it when I said I could taste the pesticides and chemicals on apples, until he convinced me to do a blind taste test with conventional and organic apples a few years ago. He was shocked that I knew instantly which was grown with pesticides, over and over again with the testing. There's a distinct flavor that is in all conventional apples, one that comes from the chemicals (it doesn't taste good). Until you consume a lot of organics, it's hard to tell the difference, because your taste buds are used to the chemical taste. Ask Jim what he thinks about the conventional apples after he has been very high raw for over a year. He can taste the difference now, too. So, that brings us to the boxes of oranges and grapefruits we have on the table. Jim isn't sure he should taste the organic oranges, or not. He adores oranges and has been eating the conventionally grown ones consistently for most of the year (4-6 per day). He thinks there's probably no difference between the two. However, he's afraid to find out for sure since he has a case of conventional ones that only he will consume (KDcat has refused to eat the conventional ones, now that she can taste the difference). I'm sure Jim will sample the differences. He's a curious sort of person, so the temptation to know will take over. He's going to be shocked when he tastes the difference. 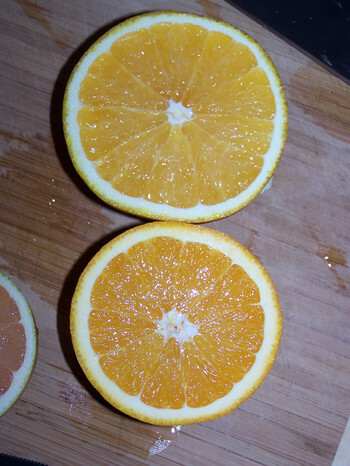 The organic orange is so juicy, sweet, and yet not overpowering with that tangy taste that oranges usually have. It feels very refreshing to eat it. The aroma of it is very strong, too! It's fantastic! These organic oranges that were picked when they were ripe are even so much different and better than the organic oranges I've been buying over the past few years! They lack that overwhelming tangy taste/feeling of the ones from the store. Maybe they are more acidic when they are picked unripe and then allowed to ripen off the tree? That's my guess, but I'm not sure. The end result is that we have tasted the Rolls Royce of oranges, but we have a used-and-no-longer-under-warranty car pocketbook. Sure, we'll probably splurge from time to time and order the freshly picked organic oranges (because, let's face it, it's not *really* like buying a Rolls Royce), but we'll most likely enjoy these until they are gone and go back to the organic ones for sale in the food co op.